This research note outlines the benefits of adopting the latest cloud ERP platform. Not all cloud ERP software is created equal. Yes, every solution runs in a browser. But some vendors are focused on continually enhancing their platforms in ways that maximize employee productivity. 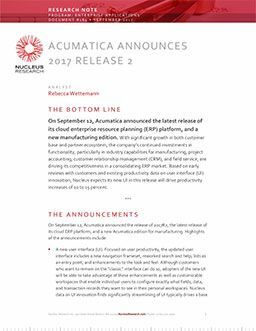 According to Nucleus Research, Acumatica’s latest release will not only help employees get more done in a highly intuitive web interface, but also provide them with feature enhancements in manufacturing, project accounting, CRM, field service, and more. Which new features matter most in Acumatica R2. What’s happening in cloud ERP—and how it could affect you. Three main reasons for Acumatica’s momentum. Who can benefit most from Acumatica’s usage-based pricing. Why Nucleus Research is optimistic about Acumatica’s future. This information could help you make a better decision about your next ERP implementation or upgrade. Download it now! This research note is provided by Acumatica, a leading provider of cloud business management software that gives mid-sized customers a complete, real-time view of their businesses—anytime, anywhere. Please click to view and download free research note!